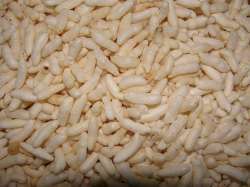 Mamra (chivra,chiwra,chiwda) is a gujarathi name for puffed rice, that is popped rice. It is also known in different Indian languages as churmure/chirmure/murmure(Marathi), mandakki / kadale puri(Kannada, kurmura/murmura(Hindi), pori(Tamil, Malayalam), mudi/muri(Bengali)etc. An ingredient that is so popular everywhere in India, this snack is worth making and tasting at any time. You will find many variations of this and you can make your own too. - Take one cotton cloth. - Fold the cloth & wet the mamra filled cloth in the bowel of water for half minute. Take out the cloth and keep aside. - now take a pan and heat 2 or 3 table spoon oil in it. - add Red chilly Powder in the oil. - add chopped cucumber or 1 tomato. - Add wet mamra into the oil. - Mix it for some time & then serve. The mamra's vaghani is ready to eat.